Send your game link/url to all of your players via email or post it on your LMS. If you prefer to add players to your Guru game yourself, you can opt to pre-register players. Here’s how to pre-register players for your game. And for added security, you can restrict access so only email addresses with your company’s domain name can register. Do you want to spare your players the task of self-registering to play a Guru game? Some organizations do. If email verification is not needed, you can opt to pre-register players for a Guru game. 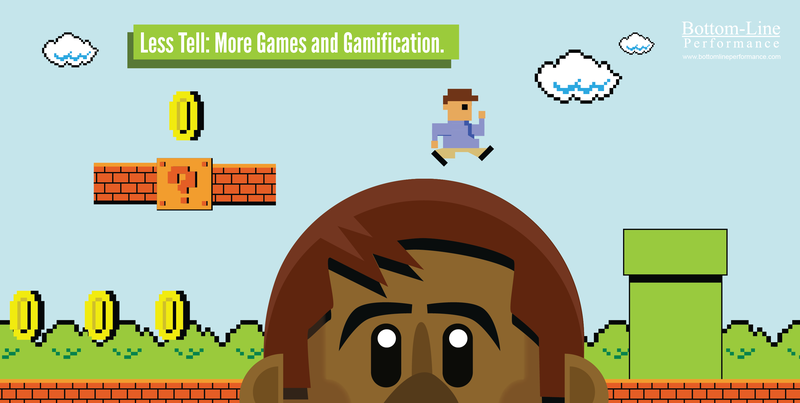 Perhaps you are unveiling a Guru game as part of a conference experience or as part of a live workshop event. 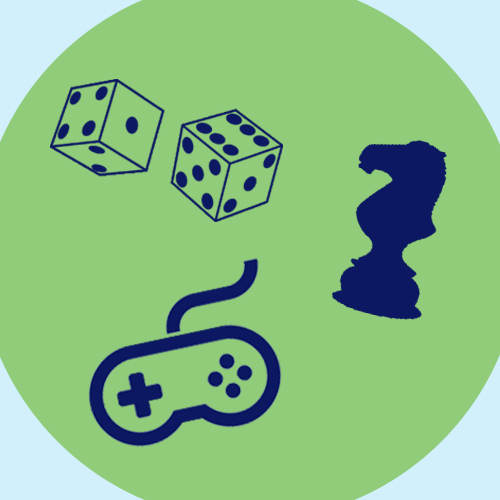 In these instances, your goal is to get everyone playing as quickly as possible with as little effort as possible. 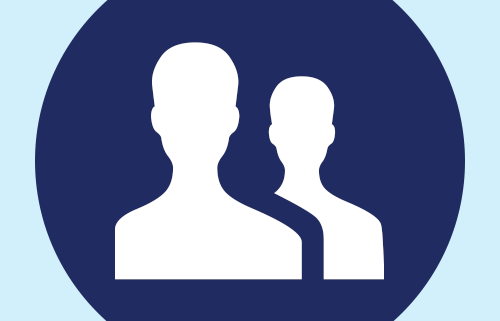 If you prefer to let players register themselves for your game, they can do so. Here’s how to let players register themselves. 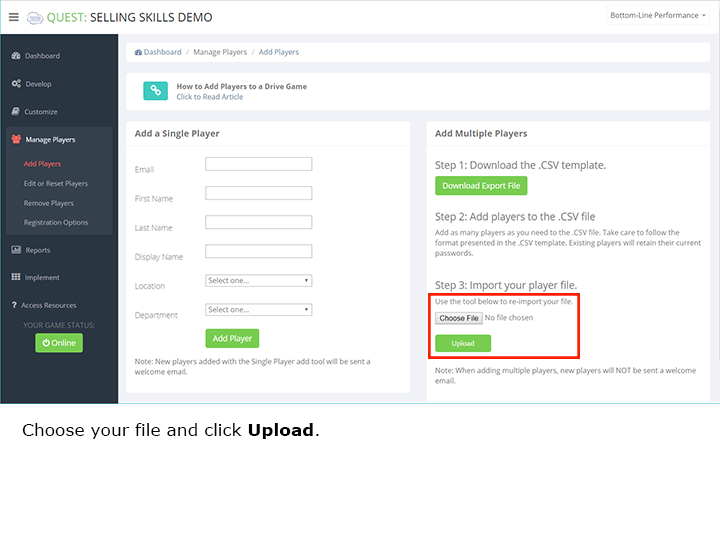 Mass uploading your players ahead of time may be a perfect solution. You can do this mass import within the MANAGE PLAYERS option in the left-hand menu. You select the Add Players submenu item within it. 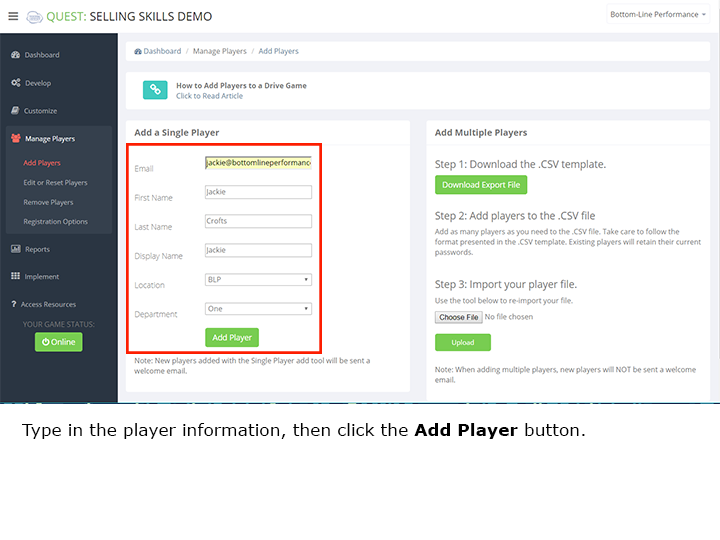 The Add Multiple Players section is located below the Add a Single Player section. 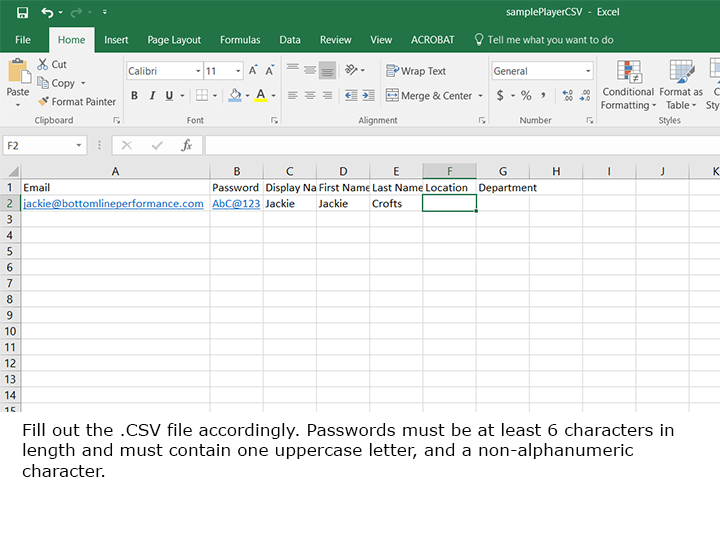 Download and use the .CSV template we provide. It tells you exactly what information to include. 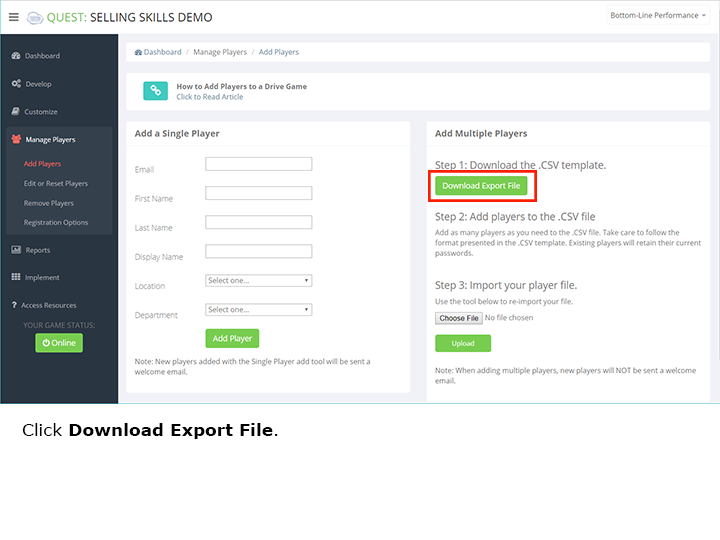 Define your user registration fields before you mass import players so that the .CSV file you download includes columns for them. 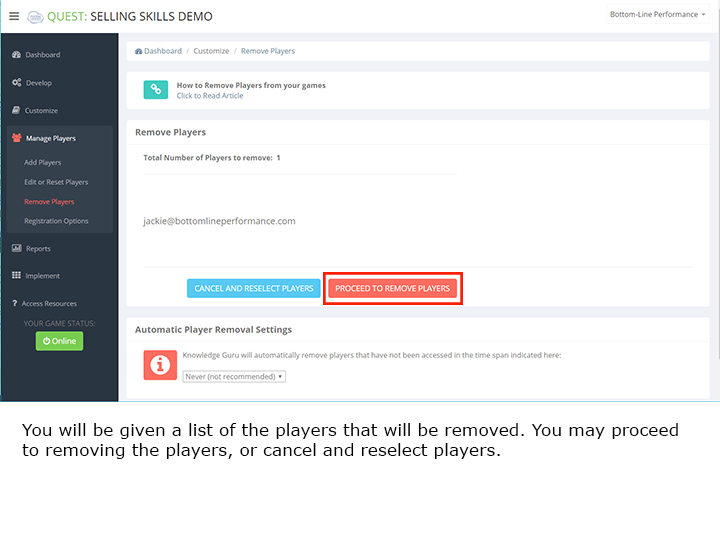 In many cases, you will have players self-register for your game the first time they log in. Other times, you will mass-register players before they play. Sometimes, you may want to add a single player to a game, particularly when you test a game before you release it. For the same reason, editing a player can be helpful. 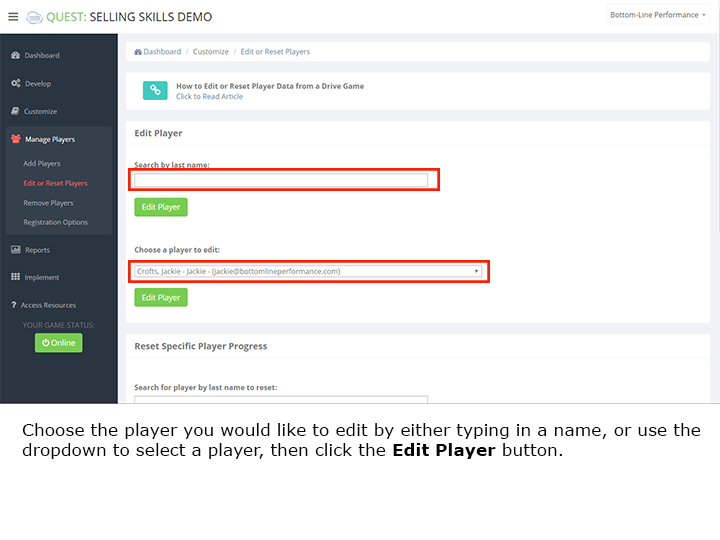 Editing a player’s information is useful, though players do have the ability to self-edit their email address or their name once they register. 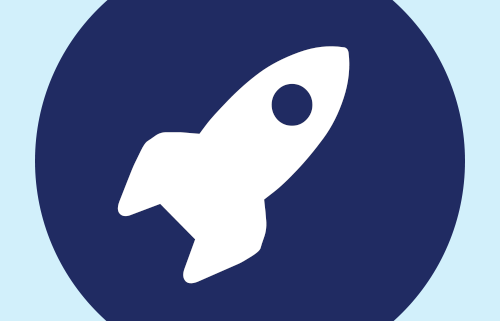 Quick Steps for Adding a Player. 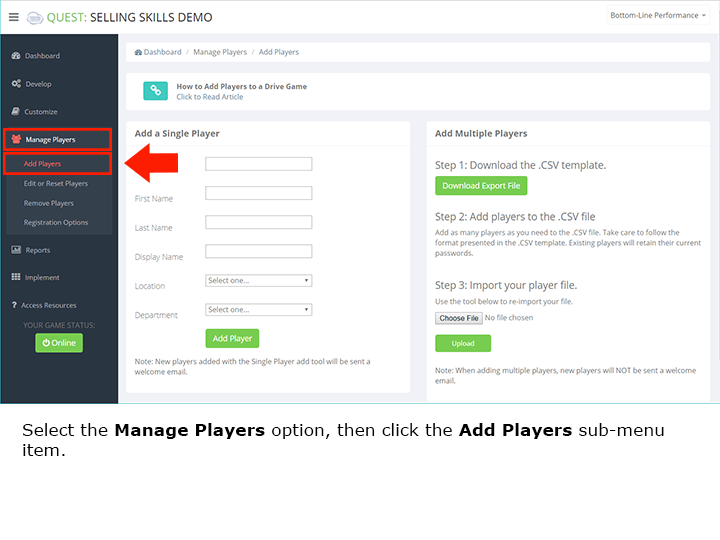 Within the MANAGE PLAYERS section, select the Add Players submenu option. Type in the player information, then click the ADD PLAYER button. Quick Steps for Editing a Player. Within the MANAGE PLAYERS section, select the Edit or Reset Players submenu option. Choose the player you would like to edit from the dropdown menu, or search for a players name. Click the EDIT PLAYER button. Make your changes to the players’ account information. When you are finished, click the UPDATE PLAYER button. 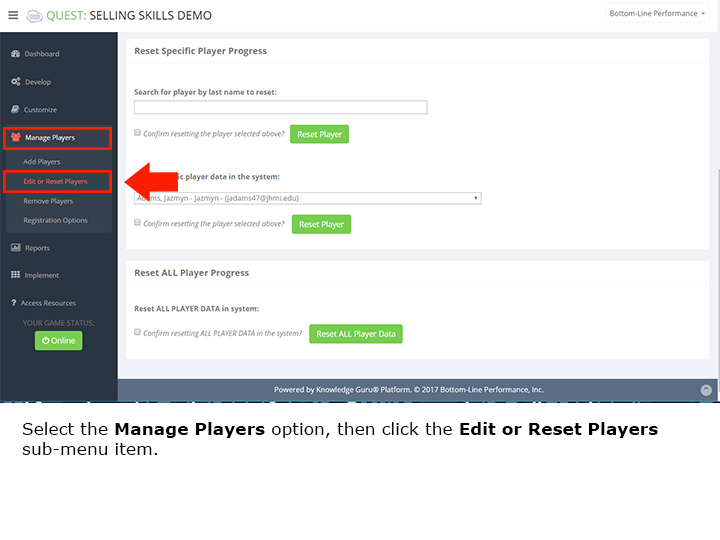 Within the MANAGE PLAYERS section in the left-hand menu, select the Remove Players submenu option. There are several options for filtering which players will be removed. 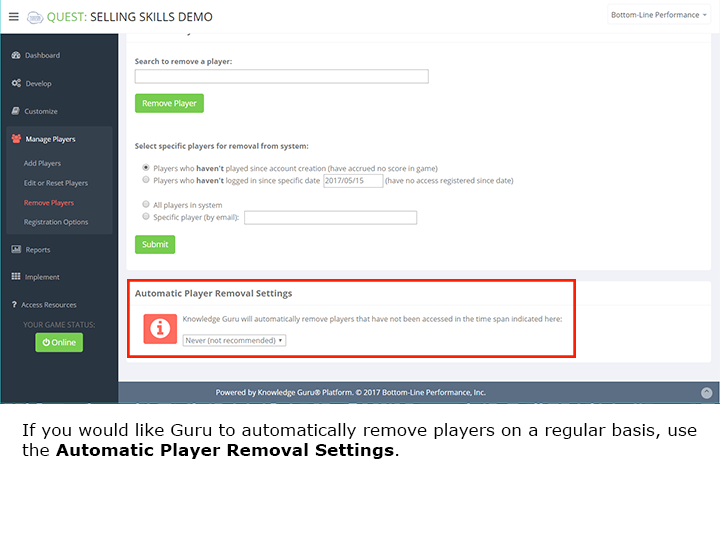 You may change the Automatic Player Removal Settings if you would like players to be removed after a period of inactivity in your game. 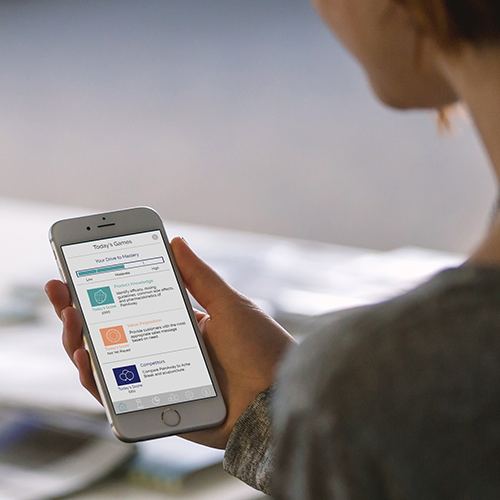 Choose the options that are right for you, then click the SUBMIT button. You will be given a list of the players that will be removed. You may proceed to removing the players, or cancel and reselect players. The system will confirm that the selected players have been removed. 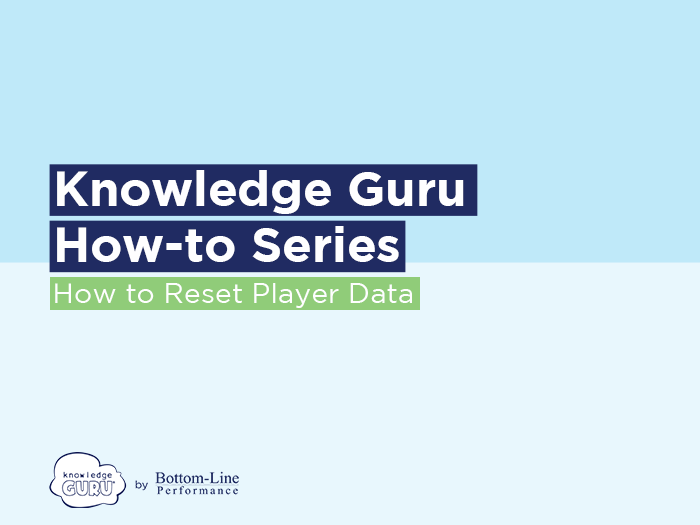 Follow these quick steps to learn how to reset player data. 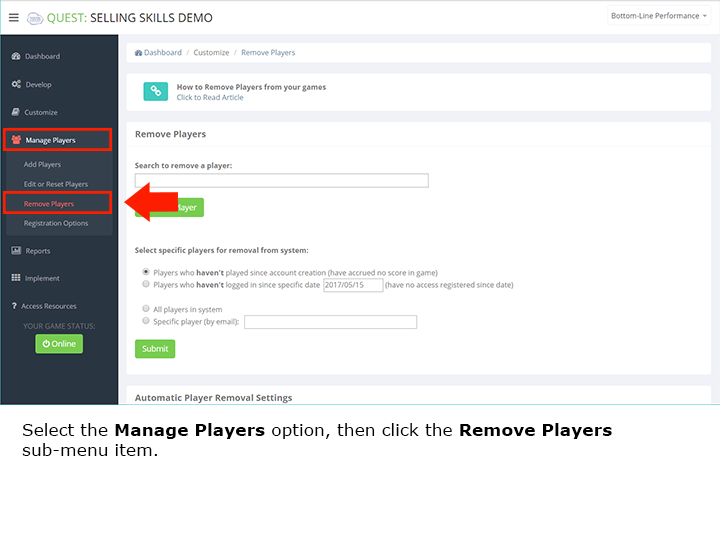 Select the MANAGE PLAYERS option in the left-hand menu. Select Edit or Reset Progress. To reset a specific player, use Reset Specific Player Progress section located below the Edit Player section. 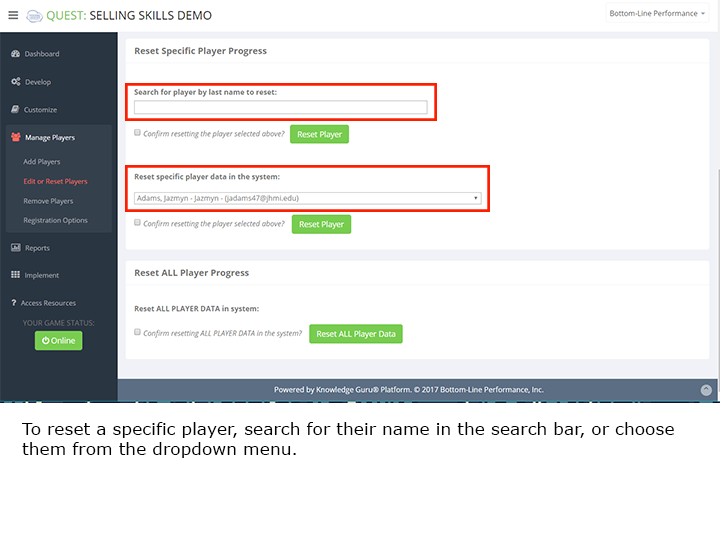 Locate the drop-down menu and select which player’s data you would like to reset, or search for a player to reset. 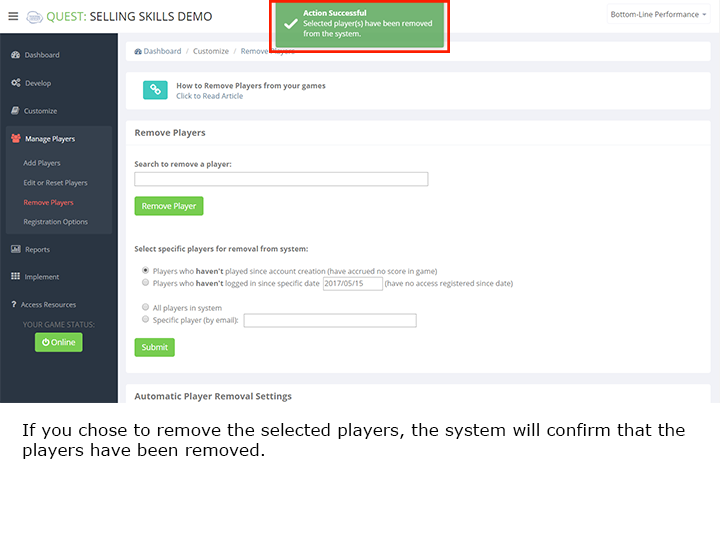 Once you have selected the specific player, confirm resetting that player by checking the box next to Confirm resetting the player selected above? 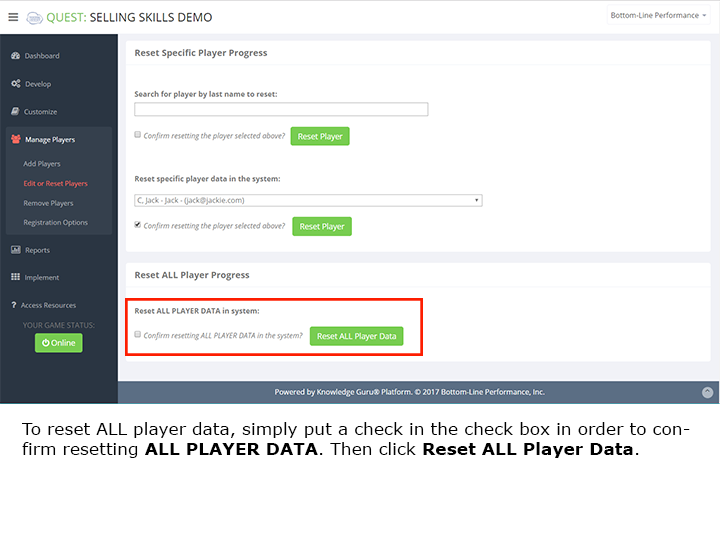 To reset all player data, find Reset ALL Player Progress. 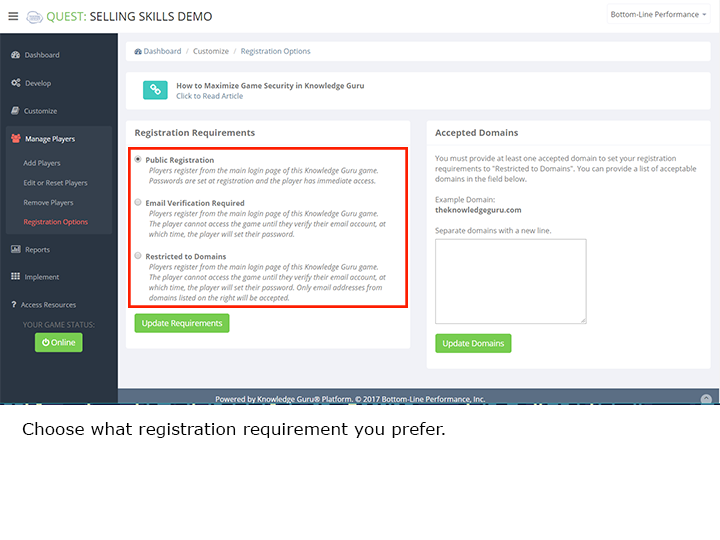 Public Registration – Players register from the main login page of this Knowledge Guru game. Passwords are set at registration and the player has immediate access. This is the default setting in Guru. 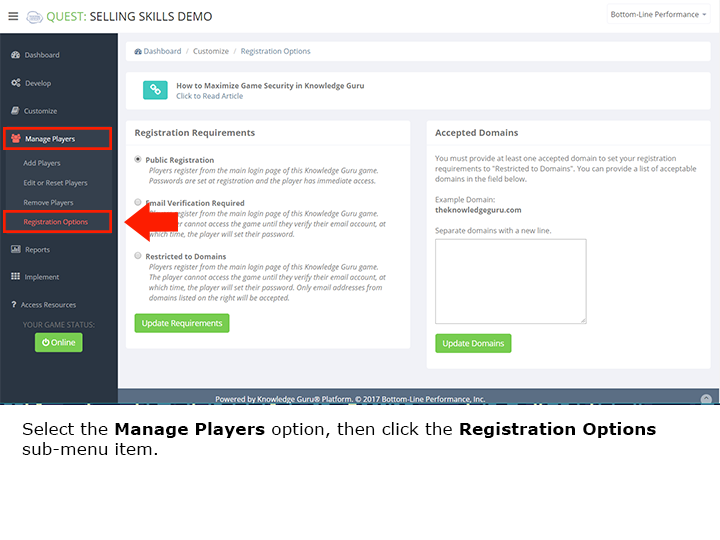 Email Verification Required – Players go to the game URL to start the registration process, but must go into their email account to click a verification link to complete the registration and access the game. Players click a link in the email to set their password and then log into the game. Restricted to Domains – Players must have a specific domain name in their email address to gain entrance to the game. With this option, players must also use email verification. The player cannot access the game until they verify their email account, at which time, the player will set their password. Only email addresses from domains listed on the right will be accepted. 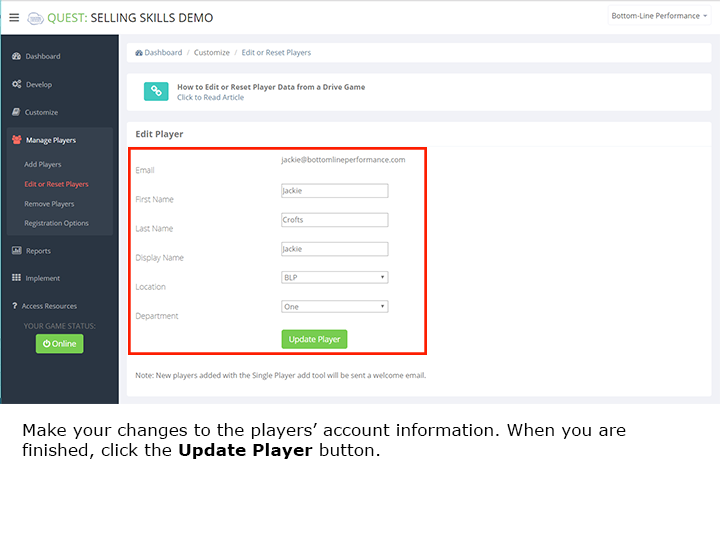 From within MANAGE PLAYERS, select Registration Options. 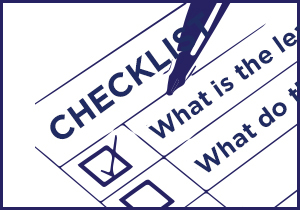 Select which requirement you prefer, Public Registration, Email Verification Required, or Restricted to Domains. 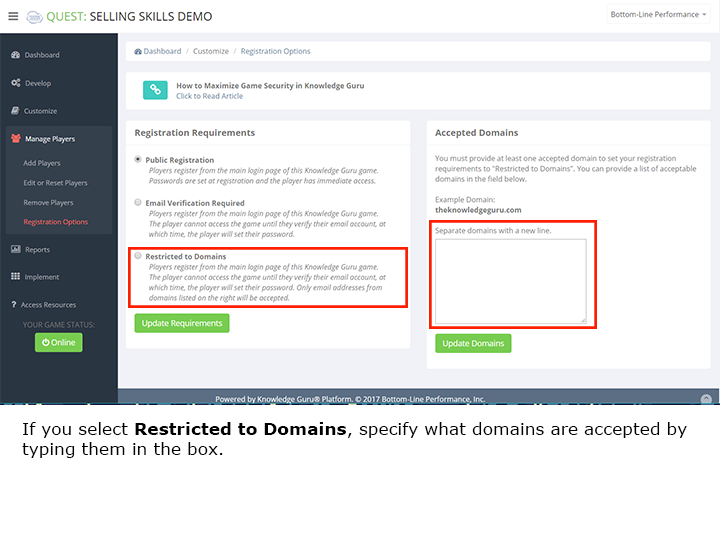 If you choose Restricted to Domains, you must specify what domains are acceptable by typing them into the box on the right. Once you have selected your option, click Update Requirements.